A few weeks ago I reported on the wines of Avantis Estate in Greece, promising that it would be the first of a small series of reports on some of the country’s most interesting wine estates. Here we have Akrathos, a very new name, having planted their vineyards in Halkidiki, in central Macedonia on the northern Greek mainland, only in 2011. Akrathos means “near Athos” and apparently the 2,033-metre holy mountain of Athos is visible from the vineyards. Unlike the heat of some southerly regions and islands of Greece, the climate here is moderated by latitude and ocean currents, to give a cooler overall growing season. Akrathos farms its vineyards organically, and focuses on indigenous Greek varieties, including Assyrtiko for white wines and Agiorgitiko – or ‘St George’ – and Xinomavro for reds. Importer of the wines, Caspar Bowes tells me they also grow a little Malagousia, though the very young vines are not yet in commercial production. The soils of the vineyard are on a slate subsoil, are said to be rich in minerals, and are planted at an altitude of between 550- and 700-metres. 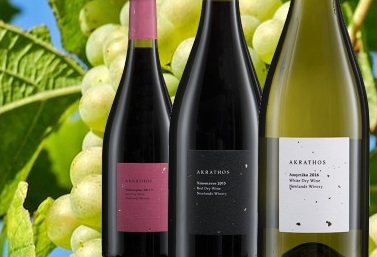 It’s exciting to see a brand new winery project hitting the ground with already very good, modern wines, so Akrathos clearly becomes part of the new wave of Greek producers to watch. Imported and retailed by The Daily Drinker. (2018) An Assyrtiko not from Santorini, but from a new venture in Halkidiki in the north of the mainland, a cool region where the grapes are picked considerably later. There's a lovely waxy citrus and almost figgy character here, in a very aromatic and quite intriguing wine, somethig like blood orange, maybe even a hint mango in the background. On the palate lovely drive and focus: salty minerals for sure, pithy lemon and zesty, tangy grapefruit, but that lighter, stony and fine earthy quality shines through into a long, citrus finish. (2018) What a lovely sweet-fruited, ripe and glossy wine this is, but tempered with a bit of real structure and bite. Twelve months in French oak barrels has rounded and added cedar and a touch of smokiness, but the purity of fruit and the taut, wirey structure of firm but ripe tannins and cherry-pit acidity is lovely. (2018) A blend of Agiorgitiko with 10% Xinomavro, this pours a really saturated deep red colour. The wine was aged 12 months in French oak, and that might partly account for the smokiness on the nose, but there's an interesting balsamic and black cherry skin character too, peppery and lifted. In the mouth it is very firm, an extracted, very dry black fruit character, pretty good structure from inky tannins and cherry acidity, and the oak again just adding a smoky, rounding quality. It finishes on dry fruit and decent acidity. I have enjoyed Gerovassilou’s Malagousia and Gaia’s Assyrtiko recently. Both make a refreshing change to the usual suspects, The first wine was tried at a restaurant. It blew us away for the money (£15). Cheers Ray – and yes, it’s the strength of those native grapes and regional styles that is so interesting, allied to an industry that is modernising and looking outward, it makes the country’s wines well worth investigating. Though they are never cheap, they seem to always be good value and moderately priced. Those fresh, sea-breezy whites are lovely.